If you've watched a lot of anime, chances are you've come across a character or another with a name like this: Tarou 太郎, Ichirou 一郎, Jirou 次郎, Saburou 三郎, Shirou 四郎, or something else that ends in rou 郎. The question is: what's the meaning behind this naming pattern? Well, it's a Japanese custom called haikoumei 輩行名, in which sons, only sons, male children, are named according to their birth order. An interesting thing of this practice is that you can tell whether a character has an older brother or not just from his name alone. Basically, the rou 郎 works as a counter, and the names come from counting those rou's. Now, the first Japanese numbers are ichi 一, ni 二, san 三, shi 四, but the haikoumei don't use those exact words, sometimes they use different readings of those kanji. Additionally, tarou 太郎 is sometimes used instead of ichirou for the first son. And the kanji for "next," tsugi 次, may be used instead of the number two. 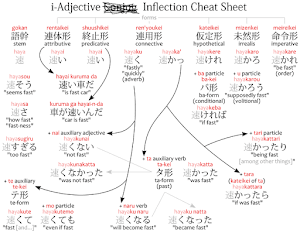 Here's a list of the haikoumei words. Note that these are not really normal "words." They don't mean anything normally, they're only used in names. Nine brothers is enough, don't you think? So, taking the words above, you can make the haikoumei. Some names are literally just the words above. A guy can be called literally Saburou. 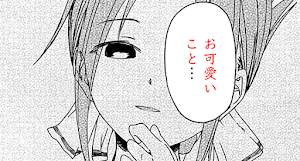 It may also be used as a suffix, like Umasaburou 馬三郎. In this latter case, it's likely he has at least two brothers, one called Umajirou 馬次郎 (or 馬二郎), and the oldest called Umaichirou 馬一郎 or Umatarou 馬太郎, following a kind of pattern. Note that this pattern applies only to sons. For example, if you have a son, a daughter, and a son. Then your third child would be jirou 次郎, because they're the second son, not saburou 三郎 for being the third child. Daughters don't count. Furthermore, beware of homonyms. The names above can be written with different kanji, in which case it won't be haikoumei anymore. Now if you're wondering what's the point in this naming system, and why it's only used to name boys, not girls, the answer is very simple: it's about heirs. Historically, the "eldest son," chounan 長男, was the heir that inherited basically everything in the family, specially the family business, deals, connections, secret scrolls, etc. So he was pretty important. The "next son," jinan 次男, and the rest nobody really cared about. So say this family had like 3 sons, and they all had random names, nobody would knows who would inherit all that family business. But if one of them is called tarou or ichirou, then you know he's the heir. It was a way of parents to say "this kid is going to be the head of the family in the future." 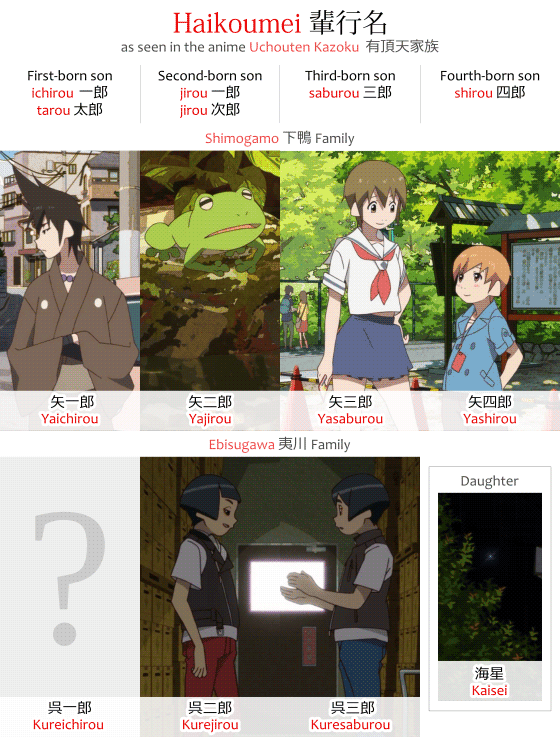 A good example of haikoumei in practice is the anime Uchouten Kazoku 有頂天家族, where a number of characters receive names according to this traditional custom. The eldest brother. The serious guy who's supposed to inherit the family, wants to follow his father's steps, and is often seen trying to do business and keep good relations with other families. The second eldest. He's a frog in a well. Literally. 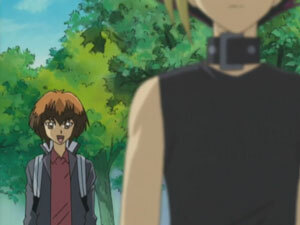 The third-born son and main character. The fourth-born and youngest son. Everybody's younger brother. Doesn't know how to transform well yet. Added to that, these four brother's father name is Shimogamo Souichirou 下鴨総一郎, making it clear he was the first-born who inherited the family. The first characters introduced from the Ebisugawa 夷川 are called Ebisugawa Kuresaburou 夷川呉三郎 and Ebisugawa Kurejirou 夷川呉二郎. Their names hint they're the third-born and second-born sons, which implies they could have an older brother called Ebisugawa Kureichirou 夷川呉一郎. The naming pattern above is rather solid, unoriginal, unimaginative and traditional. But sometimes parents don't want all their children to follow this very boring pattern, so they choose a different approach instead: including a kanji for a number in their names. For example: Youichi 陽一 for first son, Youji 陽二 for the second, and then maybe shake things up a little bit with Yuuzo 勇三 for the third son. It doesn't need to follow a pattern. In particular, some parents feel names with the number two on them are kind of bad. Everyone likes being the number one, nobody likes being number two. So they may name their first child with a number one, but choose something else for their other children. There's also nothing to stop a family from naming people based in numbers following their own made-up pattern rules. In the anime movie Your Name, for example, the women of the Miyamizu 宮水 family are named according to the birth order, but across generations. 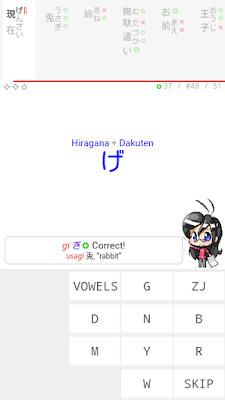 ha は becomes ba ば in Futaba ふたば because of a changed of pronunciation called rendaku 連濁. 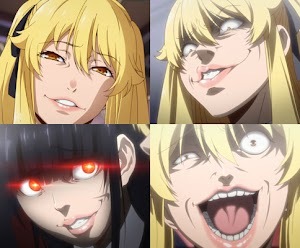 Knowing how haikoumei work can let you guess that a character has older brothers. However, it isn't absolute. There's nothing that says parents are obligated to follow naming patterns for their children. You can be named Kakuzou 角三 and not be the third son or child. Maybe your parents just wanted to name you that and the three there has another meaning, or maybe no meaning at all, maybe they just liked how it sounded. Your name can end in juurou 十郎 but you don't have nine siblings. Maybe you and your brother both have names ending in tarou 太郎, who knows? So it isn't absolute. But it's interesting to know it exists.